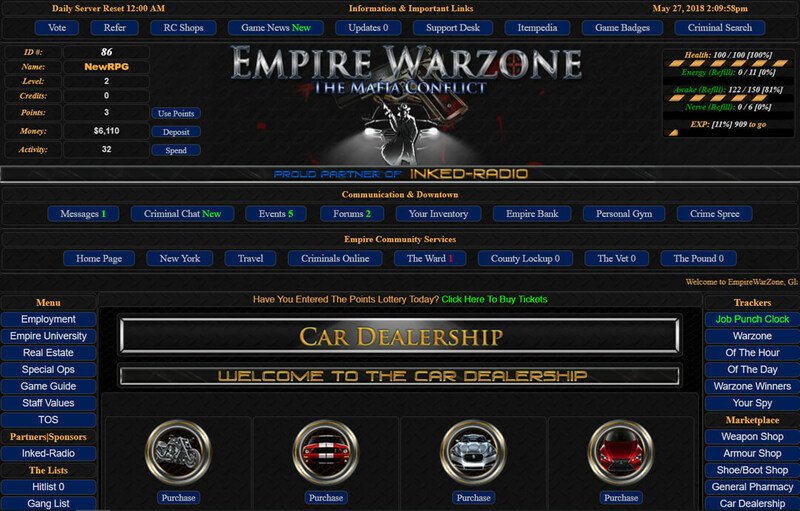 Empire Warzone is a mafia-themed browser game. There are crimes like Mug a Millennial, Dine & Dash, steal a purse and much more. Complete Special Ops for points, experience or cash. Compete against other Criminals to earn a place in the Weekly Warzone. Buy a pet to participate in a pet track, they can do almost everything you can do and they give your stats a nice boost. There’s also an opportunity to pray once a day – select a prayer to get more money, points or experience. Welcome to the Empire. Love the challenge. Old school format.. you may find it addictive! Great gameplay. Challenging objectives. Exceedingly stable for a new release. Firm but fair owners, and a great supporting staff. Once you check it out, you will not be disappointed. Having been a player of this type of game for many years, I can honestly say I see no reason to not give Empire Warzone 5 full stars. Enjoying it quite a bit. Nice to see Old School till holding up and proving its worth. Hope to see more come to the game and find their Empire too. Pretty fun game, old school.